Do You Know the Muffin Pan? : Day 27 - Stay POSITIVE! Today's post is about being POSITIVE! And to help me out, I have channeled the beautiful, talented, and EXTREMELY WISE spirit of Marilyn Monroe. 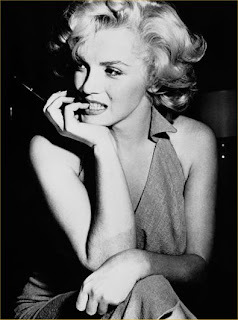 Marilyn Monroe may play a ditsy blonde in most of her films but off screen she is a pretty smart lady. So here are some quotes, courtesy of my lady Marilyn about staying positive and loving yourself.. even if others can't. "This life is what you make it. Not matter what, you're going to mess up sometimes, it's a universal truth. But the good part is you get to decide how you're going to mess it up. Girls will be your friends - they'll act like it anyway. But just remember, some come, somg go. The ones that stay with you through everything - they're your true best friends. Don't let go of them. Also remember, sisters make the best friends in the world. As for lovers, well, they'll come and go too. And babve, I hate to say it, most of them - actually pretty much all of them are going to break your heart, but you can't give up becuase if you give up, you'll never find your soul mate. You'll never find that half who makes you whole and that goes for everything. Just because you fail once, doesn't mean you're gonna fail at everything. Keep trying, hold on, and always, always, always believe in yourself, because if you don't, then who will, sweetie? So keep your head high, keep your chin up, and most importantly, keep smiling, because life's a beautiful thing and there's so much to smile about."